Oh, Amazon. Just a couple weeks after the Authors Guild’s overzealous copyright-maximalist stance forced the bookseller to modify the Kindle 2’s text to speech feature, the company’s lawyers have had a fit of irony and sent out a DMCA takedown request to MobileRead, claiming that the site’s links to a Python script that enables Kindle owners to shop at Mobipocket-format ebook sites constitutes circumvention of the Kindle’s DRM. There’s all kinds of corporate-lawyer idiocy at play here: MobileRead was just linking out to another site hosting the script, which can’t actually be used to break Kindle DRM, and the only people using it are the people who want to buy more books — not exactly the sort of customers you’d want to piss off. Amazon’s sole motivation here seems to be the fear that people might buy Kindle content from somewhere besides Amazon, and it appears to be using copyright law to try and prevent that. Another corporation driven mad with DRM power? Say it ain’t so. 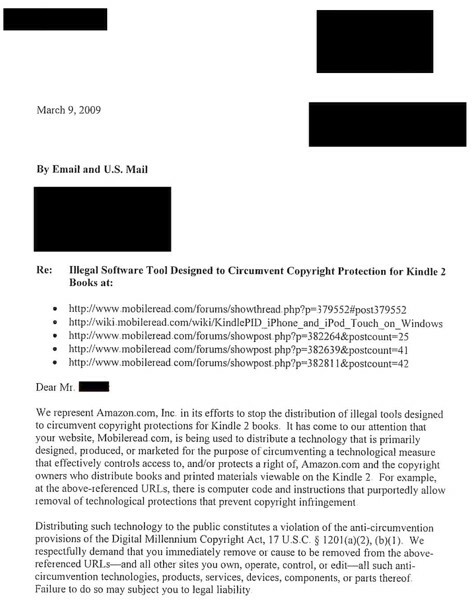 Amazon using DMCA to restrict Kindle content sources originally appeared on Engadget on Fri, 13 Mar 2009 16:48:00 EST. Be the first to comment on "Amazon using DMCA to restrict Kindle content sources"